The Office of Information Technology Services provides and supports technology that is useful, innovative, and integral to the delivery of university curriculum and to the fulfillment of the University’s mission and vision. The Office of Information Technology Services will be recognized as a high performing team that provides technological excellence and advances teaching, learning, research, and student success in alignment with Hawai’i Pacific University’s mission and goals. The AVP/CIO of the IT department Cody Down, comes with more than 20 years of IT experience, including 10 years of both technical and managerial experience at the University of Washington and a Master of Science in Information Systems from Minot State University. His office is responsible for ITS management, strategic vision and planning, budgeting and contract management, project oversight, department outreach, staff development, and IT Representation in various senior leadership committees. ﻿The department of Instructional Technology and Client Services provides IT related support for the University Community including the Oceanic Institute and 5 Military Campuses. Duties include the purchasing, setup, and support for desktops, VDI’s, printers, and phones, as well as technical support for Wi-Fi access, desktop software suites, password resets, and other frontline technical issues. Technical support is offered for 60 + classrooms and 12 + conference rooms throughout the campuses. Audio & Visual support is also provided for faculty, staff, and student events. 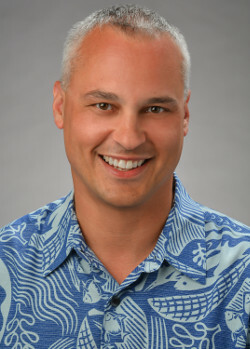 Enterprise Application and Data Management is one of three Information Technology Services Departments reporting to the Associate VP and Chief Information Officer at Hawaii Pacific University. ITS EADM designs, acquires or develops, implements and maintains academic and administrative computing resources to support the HPU Community. ITS EADM continuously aspires to re-engineer university processes using the latest technology to leverage current investment in digital solutions and resources. The Network and Infrastructure department is responsible for the overall health and wellness of HPU's IT infrastructure information security and network connectivity including, wired and wireless connectivity, network switching and routing, next generation firewall management, incident response and forensics, and end user information security awareness training.